Keeping track of historical data, analyzing trends, and making predictions is essential for every successful business in the 21st century. And they need you to take care of these tasks. Statisticians are valued in every company. They earn a lot of money (the average annual salary in the US exceeded $80,000 last year), and they bear a lot of responsibility. And I have more good news for you: You won’t have to outclass dozens of other job applicants in your interview. Often you will be the only one applying for the job, or one of the few. Summarized and underlined, you have chosen a great career. Let’s have a look at what will happen in your interview, and how you can ace it. What do you want to achieve as a statistician in our company? Imagine that you come to work, and there are no tasks assigned to you. What will you do? Describe a time when you made a bad prediction or analysis. Why did it happen? A common misconception is that you will face a lot of technical questions in your statistician interview, such as “What is Null Hypothesis?”, “List common sampling methods.”, or “How you’d prevent over-fitting?”. A person leading an interview with you won’t be a statistician. And since this role is very specific, the HR manager (or anyone else who interviews you for the job) won’t be able to evaluate your answers to technical questions. Therefor it makes no sense to ask the questions. You need to have a degree from Statistics, Mathematics, or a related field to apply for this job. Since this is basic requirement, and corporate sphere has not yet lost trust in our educational system, they won’t doubt your technical skills in statistics. You have to have them (or at least be ready to learn them quickly) when you earned your degree. If not technical, what questions will you deal with then? They will be interested in your opinions, attitudes, and skills. 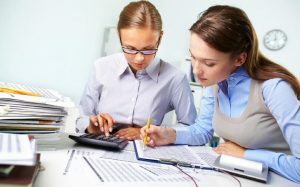 They will wonder how you’d approach various situations that happen in the workplace, and how you’d deal with various problems that occur in the work of a statistician. They will try to understand your motivation, goals and plans, to see whether you can stay with them in a long run. Last but not least, they will be interested in your working experience, to see what you have done before, and how it has shaped you as a person, and as a statistician. 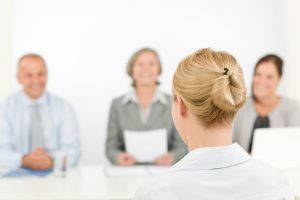 Personal and behavioral interview questions will help them with the task. 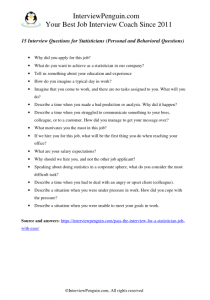 In 4 out of 5 cases, your interview will consist mostly in these questions. Let’s have a look at some of them. Try to address two things in your answer: why you applied for a position of a statistician, and why you applied for the job with them. To the first one, you should refer to your skills and passion for the work, and the value you can bring to any company as a statistician. Show some self-confidence. Tell them that you believe to bring onboard an interesting analysis and predictions that will help them to stay ahead (or get ahead) of their competitors. To the second one, you should refer to something that distinguishes the company from their competitors, at least in your eyes. It can be interesting product range, scope of duties/responsibilities of the statisticians, motivating working environment, great reputation of the company, or anything else. Instead of talking about personal accomplishments, such a getting recognition for your work, gaining promotion, or becoming excellent in what you do, you should refer to things you want to achieve for the business. This is the attitude you should present in your interview. And what things do I talk about? Helping them to become number one on the local/international market, helping them to avoid losses that result from wrong predictions, helping them to understand their business better, and what stands behind the good (or poor) results, etc. Refer to the practical things. Talk about subjects in school that helped you to get ready for the job. Refer to different statistical methods you learned that will allow you do perform a complex analysis of data (but try to explain this in a simple way). Talk about your past working experience with enthusiasm. Tell them not only what you did, but also how your duties prepared you for the role in their company. And if you apply for your very first job, try to stay positive! Everyone has to start somewhere, and the things you did at school, combined with your motivation and right attitude, will suffice for most entry level jobs in the field of statistics. People without a passion for numbers and analyzing them will get bored in this work easily. Statistics is a repetitive work, and you should enjoy such work. Tell the employer that you expect to sit in front of your computer and work with the given data, using your best abilities to analyze them, and to make predictions. You may also collect data on your own. The key is to show them that you want to be busy, and are ready to take initiative on your own. This is exactly where the difference between average and excellent employees stands. Average employees will enjoy the easy day. They will drink coffee, chat with colleagues, and check some historical data. Excellent employees, however, always try to use the time in work to the benefit of the employer. Say that you will either take the initiative and start your own analysis, or that you will study the internet for the latest trends in statistics, trying to learn something new, something you can apply in your work. Good statisticians are ready to admit making a mistake. Do not pretend to be impeccable. Do not blame someone else for the mistakes you made. Clearly say why you failed, and most importantly, emphasize the lesson you learned during this experience. Without failing we will hardly progress in our lives. Show the employer that you have the right attitude to work, and consider wrong predictions an inevitable part of the game. Language of a statistician, and a language of a manager, are quite different. Unless you change your language, you will often experience misunderstanding in your work. Show the hiring managers that you do not mind going an extra mile for your colleagues, preparing charts and illustrated reports, using pictures and demonstration, and basically doing your best to “translate” the technical language of a statistician to a language of a common men. If we hire you for this job, what will be the first thing you do when reaching your office? Why should we hire you, and not the other job applicant? Speaking about doing statistics in a corporate sphere, what do you consider the most difficult task? Describe a time when you had to deal with an angry or upset client (colleague). Describe a situation when you were under pressure in work. How did you cope with the pressure? Describe a situation when you were unable to meet your goals in work. You won’t compete with many people in your interview, but you will have to convince the hiring managers of your readiness for the job, and of the right attitude. 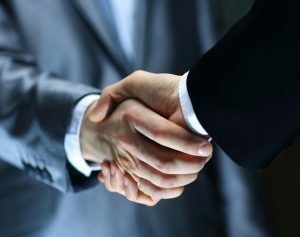 In most cases, you will deal primarily with personal and behavioral questions. Prepare for the questions from our list, and check also other sources. And if you need some help with the answers, or want to know something other people won’t know while competing for the job with you, check out our Interview Success Package. Thank you! Portfolio in an interview – Learn how to prepare a selection of your best works, and how to use it to show the interviewers the value you can bring to their team.